Russula ventricosipes is probably the most distinctive member of the foetid russulas group. Its habitat alone makes it easy to identify; it grows in sand dunes along the Great Lakes and the East Coast, usually near pines. 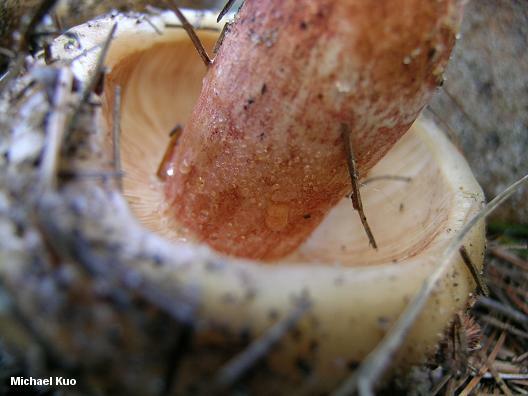 Additionally, it has a thick, sturdy stem that is flushed with red, at least towards the base--and it has the maraschino cherry odor that typifies the foetid russulas, along with an acrid taste. 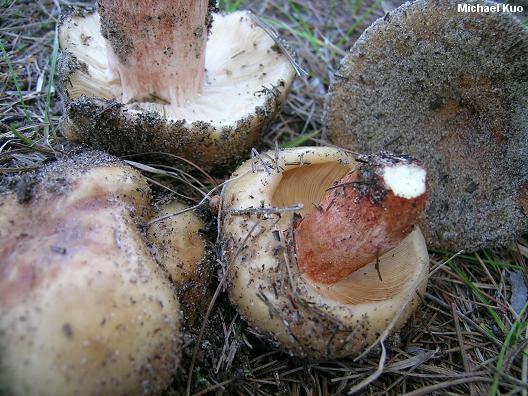 Though it is large and beautiful, Russula ventricosipes is likely to be overlooked, since it is frequently buried neck-deep in the sand, visible only as a "mushrump." However, it is well worth your time to turn this mushroom over; while the colors of the cap surface are likely to fade in the direct sunlight, its gorgeous stem is a pleasant surprise. Ecology: Presumably mycorrhizal, since it is a Russula--but its odd habitat does raise questions. Growing alone or gregariously in sand dunes; usually with pine trees in the vicinity; along the Great Lakes and the East Coast; summer and fall. Cap: 4.5-13 cm; convex with a tucked-under margin when young, becoming broadly convex to flat with a shallow depression; slimy when wet and fresh (with sand "glued" to the surface), but soon dry; covered with a felty, pinkish to orangish layer when young, but soon becoming smooth overall, or remaining felty along the margin; yellowish brown, sometimes with orangish shades; the margin lined at maturity; the skin peeling away easily from the margin, sometimes beyond halfway to the center. Gills: Attached or pulling away from the stem; close; sometimes forked near the stem; yellowish white, developing orangish or reddish edges; often spotting or discoloring yellowish brown to brownish. 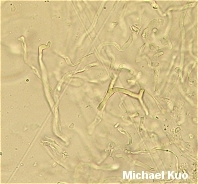 Stem: 2-10 cm long; 1.5-5 cm thick; often swollen in the middle; stuffed and thick; sometimes slightly wrinkled lengthwise; white underneath a layer of reddish to brownish red scurf that begins at the base and may extend nearly to the apex. Flesh: Whitish; becoming slowly pale yellowish on exposure or with age. Odor and Taste: Odor weakly to moderately reminiscent of maraschino cherries, almonds, or benzaldehyde; taste acrid. 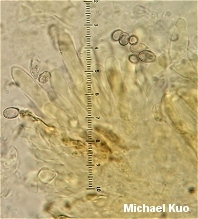 Microscopic Features: Spores 7-10 x 4.5-6 µ; broadly elliptical to lacrymoid; with very tiny warts projecting less than .5 µ (appearing nearly smooth even with oil immersion); connecting lines rare and scattered. 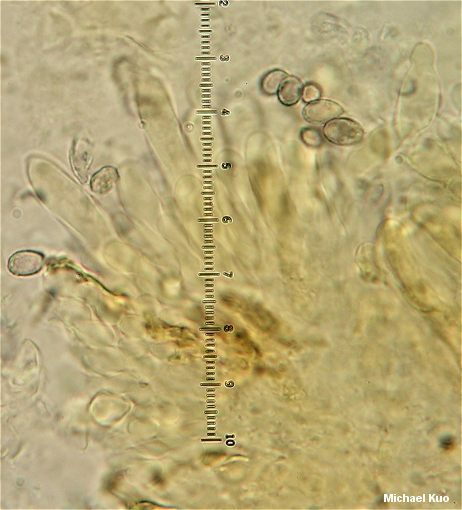 Pileipellis an interwoven cutis/trichoderm; clearly defined pileocystidia absent, but some hyphal tips cystidioid, with granular, sulphovanillin-positive contents. REFERENCES: Peck, 1902. (Burlingham, 1915; Shaffer, 1972; McKnight & McKnight, 1987; Kibby & Fatto, 1990; Barron, 1999.) Herb. Kuo 09120412.